She was born in Chicago in the summer of 1907. She was the 23rd out of 30 of lot 3512 from the Pullman Co., all sold to the Boston & Maine Railroad. At first, she was assigned to the best passenger trains, but in just a few years, new steel coaches were introduced which put the older wooden coaches into the less glamorous services. The 1246 went into service on the lesser lines where the best equipment wasn't needed. No doubt she was used on the branch lines in southern New Hampshire or central Massachusetts or in commuter service out of the North Station to places in Massachusetts, such as Reading, Wakefield, Bedford, or Concord. In that less glamorous service, she soldiered on throughout the depression and World War II. As the automobile took over the majority of the transportation chores, the railroads suffered, particularly in the passenger business. Lines were abandoned and services cut back. Passnegers complained about the old wooden cars that were cold, drafty, and worst of all, old fashioned. The railroads wanted to upgrade the coaches used on the remaining lines. The result was that lines and lines of these coaches were hauled unceremoniously out behind the Bellerica shops and set on fire. What didn't burn down could be sold for scrap. By that time, the 1246 had gotten a new number. The railroad bought new coaches so the wooden coaches had to give up their numbers and the old girl was bumped down to 246. 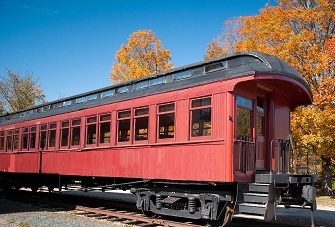 She had gone from Pullman green to a coach maroon in the early post war years, but still kept on until January of 1950 when she was taken to the shops in Concord, New Hampshire and given a new lease on life. The railroad removed all the seats and cut large doors in the sides so that heavy equipment could fit inside. Old 1246 had gone from the best and newest, to a mobile storage trailer working on track maintenance. The nicks and gouges can still be seen where rough handling and carelessness took its toll. She was given the new number, W3238. Our old friend kept at it while most of her type went up in smoke, until 1959, when a wealthy industrialist, Nelson Blount, bought her for his museum and tourist train operation known as Steamtown. All that Blount had done for her was give her a coat of yellow paint and install some benches, giving her the new name, Mount Sunapee. She ran on his line from Walpole, NH to Keene, and then from Bellows Falls, VT to Chester, VT. This lasted until the late 60's when Blount bought newer steel coaches and stopped using his collection of antique wooden cars. Many of these cars went to Strasburg Railroad in Pennsylvania where they are today, many times rebuilt. But not our friend. She sat on a siding in Vermont at the location of the old Steamtown museum in the company of two other old-timers, all of which were in too bad of condition to travel to Steamtown's new home in Scranton, PA. It really looked like the end for this old girl. Leaks in the roof, missing siding, and rotted floors. She was good for nothing but a catchall for scraps and useless junk. In the early 1990's, David Woodbury negotiated the release of the 1246 for almost a year. After acquiring the coach, Woodbury had performed much rehabilitation and restoration while she sat on his property for almost 15 years. In the fall of 2007, Woodbury donated the coach to the Contoocook Riverway Association, and this is where she rests today.